Day 1 of reconference kicked off on a strong note with a morning plenary on the harms of criminalization, and alternative ways to approach justice. Through the rest of the day, participants got the opportunity to delve into one or more of our nine key themes through a combination of breakout sessions, performances, panels, curated spaces, films and installations. The evening plenary was an insightful conversation between Iranian photo-historian Azadeh Akhlaghi and scholar Sabeena Gadihoke. It was followed by a sharp, witty, hilarious cabaret performance by Mexican group 4 Queens. Akhlaghi’s work in By an Eyewitness reconstructs the tragic deaths of important Iranian figures – writers, poets, revolutionaries, dissidents – who, had they lived, would have forever changed the course of Iranian history. These incredibly detailed photographs are a result of painstaking archival research and almost always feature an object that exists at a future time from the date of the death it is documenting, like a book of poems published twenty years later. Since newspaper and radio reports cannot entirely be trusted because of Iran’s history of state censorship, Akhlaghi relies on oral histories and narratives by eyewitnesses to reconstruct important details about the deaths she documents through the series. However, she often finds that memory is incredibly slippery and unreliable – and that in some cases, like the death of exiled filmmaker Sohrab Shahid – no immediate eyewitnesses to the death exist at all. 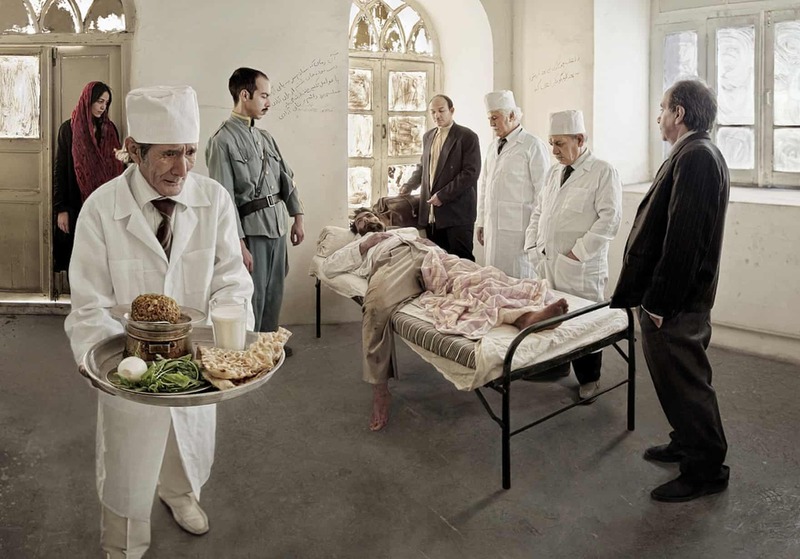 Akhlaghi’s staged photographs are incredibly detailed and layered because of the sheer number of references she uses from film, literature and the other arts. She works with actors, who are shown these visual references so that they can bring the same qualities into the way they appear in Akhlaghi’s photography. Akhlaghi is influenced by Tolstoy and Balzac, saying she keeps rereading the former because of his ability to write a scene with a huge cast of characters in it. This is what Akhlaghi seeks to do in her large, panoramic tableaus as seen in By an Eyewitness – and her photographs achieve the extremely difficult task of having multiple points of focus at the same time. Akhlaghi’s staged photographs are cinematic in nature, even though tableau photography is generally not cinematic. This is at least partly due to Akhlaghi’s enduring love and fascination for painting. This is also one of the reasons why the pictures are not completely “realistic”. For example, in her recreation of Hamid Ashraf’s assassination, the scene should have been full of blood – but in Akhlaghi’s portrayal, there is very little blood and a lot more focus on lighting and showing Ashraf as a kind of Jesus Christ figure. People shared pictures from By an Eyewitness on social media, saying that they were actual historical documents instead of staged photographs created much later. Initially, this kept Akhlaghi up at night – after all the research and effort she’d put in, she felt scared at the thought that the work was being received in this manner. Eventually, Akhlaghi decided to let it go, realizing that she cannot control how her work is perceived once it is out there. In her reconstruction of Mahmoud Taleghani’s death, a little boy looks directly at the camera. He is meant to be a representation of Akhlaghi herself. Taleghani’s death is the only one she documented that occurred in her lifetime; she was born in 1979, the same year he died. The boy – and Akhlaghi – use that gaze to question the vicious cycle of state violence against dissenters, on behalf of a whole new generation of Iranians.